Aquatic invasive species (AIS), is a huge concern for lakes statewide. Invasives threaten to destroy native habitat for fish and other wildlife, property value and the quality of recreation on the water. 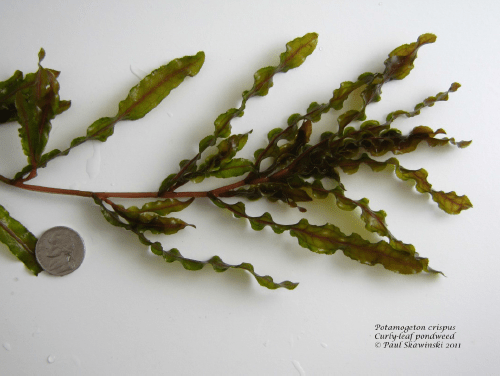 The majority of our district budget is directed at managing the invasive weed we’ve harvested for more than a decade, curly leaf pondweed. Clean Boats, Clean Waters Program – free boat checks at 2 landings, educate boaters about prevention steps. We perform 300 – 400 volunteer hours per season and this year have hired 400 PAID hours during high traffic weeks (75% paid by DNR grant). Monitoring for new invasives: zebra mussels, Eurasian milfoil. Tom Borden has installed 4 zebra traps around the lake; in 2018 we hired Polk County Land & Water Resources to monitor 276 intercept points, 2 times per season to look for new infestations of invasives. Rapid response plan ready for new infestations. AIS in Blake Lake: Curly-leaf pondweed, banded mystery snail, Chinese mystery snail. Why? Because these invasives are very difficult, expensive and almost impossible to get rid of. Eurasian Milfoil is dangerous, quick to spread: It only takes ¼ inch of the plant fragment to start a new population. Small fragments can blow from one side of the lake to the other. Costly: In another lake district in the area, members pay $600+ each per year to treat milfoil with herbicide. Extra caution: 5 nearby waters have milfoil; Horseshoe, Pike, Long Trade, Cedar (and St. Croix River). Nearby in Twin Cities (TC) lakes: 150 TC lakes have Eurasian milfoil. 275 lakes in Minnesota have Eurasian milfoil. Many members and visitors to Blake Lake are from the TC metro, only 77 miles away. Zebra Mussels have been found nearby in Deer Lake, Forest Lake, MN and St. Croix County: Bass Lake and Lake St. Croix. Nearby in Minnesota: 141 water bodies have zebra mussels! With the growing concern over the spread of aquatic invasive species (AIS) to Wisconsin’s inland lakes, many lake district members and other concerned citizens are looking for ways to get involved. The Clean Boats, Clean Waters volunteer watercraft inspection program is an opportunity to take a front line defense against the spread of aquatic invasive species. 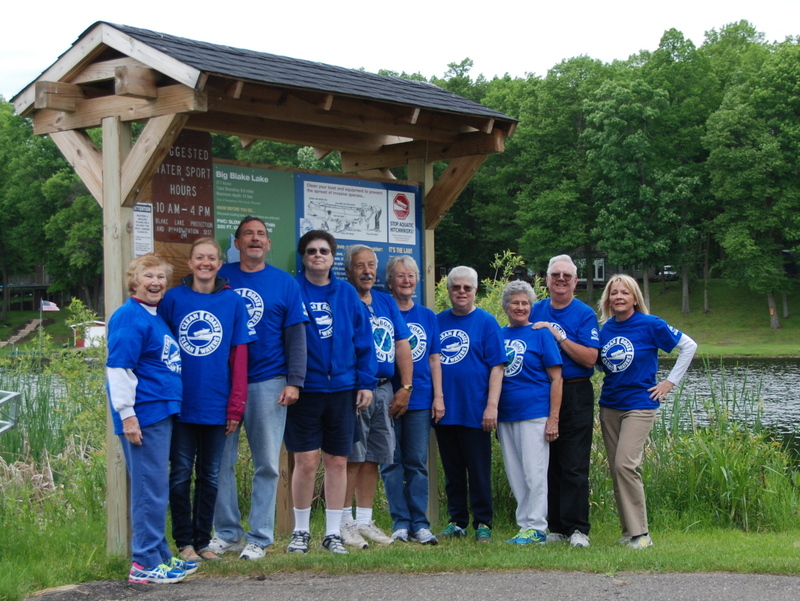 Clean Boats, Clean Waters volunteers are active! Each year our members sign up to be a part of the Clean Boats, Clean Waters (CBCW) statewide program for our lake! We put flyers in bait shops, educate boaters at the landings and conduct free boat checks May through September at east and west boat landings. Volunteer inspectors work to assure that boaters do not accidentally spread Eurasian water milfoil, zebra mussels, and other aquatic invasive species (AIS). Our volunteers participate in the June DNR Drain Campaign, a statewide initiative started in 2014 to remind anglers to “drain and ice” – drain all lake water from boat, live-well, and bait buckets… and ice your catch. In July our volunteers participate in the DNR July 4th Landing Blitz, talking to boaters with heightened tips about preventing the spread of invasives. We are one of 290 lake districts in 53 counties in Wisconsin participating. See newspaper article from 2015 efforts. Our CBCW team is increasing awareness among Blake Lake district members and visiting boaters that AIS is a serious issue on area lakes. Learn more about Clean Boats, Clean Waters? New Clean Boats, Clean Waters Watercraft Inspection Video Scenarios are now available to view on the CBCW website! Seven scenarios were created to help volunteer inspectors learn how to have a conversation with boaters and anglers at the boat landing while conducting an inspection. An introductory video explains the purposes of the scenarios, and the first scenario provides an example of a complete watercraft inspection from start to finish. The following six videos focus on specific scenarios, such as how to talk to an angler leaving the landing with live bait, and begin after the inspector has introduced themselves to the boater and asked some of the initial questions from the inspection report form. The last video discusses how to thoroughly take the prevention steps and walks through the process of cleaning off a boat. These videos are meant to enhance the CBCW training, not replace them, and serve as a post-training resource for our inspectors. For new volunteers: Watch this 7-minute video about boat and trailer inspections. Join Us! To volunteer email by clicking here or call 612–940–2006.